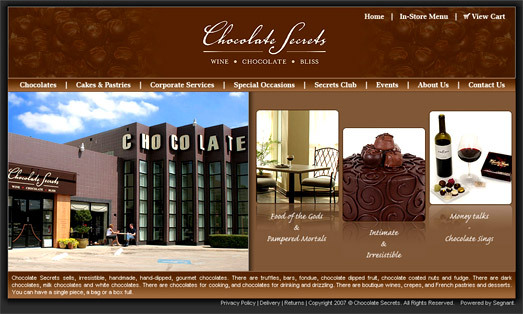 Chocolate Secrets sells, irresistible, handmade, hand-dipped, gourmet chocolates. There are truffles, bars, fondue, chocolate dipped fruit, chocolate coated nuts and fudge. There are dark chocolates, milk chocolates and white chocolates. There are chocolates for cooking, and chocolates for drinking and drizzling. There are boutique wines, crepes, and French pastries and desserts. You can have a single piece, a bag or a box full. 3. Secrets Club section allows users sign up to receive emails; user information is stored in the site's database. Segnant created a site with a fully-customized admin backend tool for managing products and orders effectively.